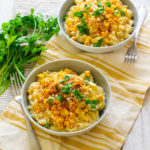 Combine the best of both worlds: cheesy, creamy homemade macaroni and cheese with the savory, slightly spicy goodness of Mexican street corn. A couple weeks ago, Nick and I went out on a date to a local Mexican restaurant and he tried Mexican street corn for the first time. And he fell in love, as he should (with the corn… he’s already in love with me haha!). The restaurant served the roasted corn on the cob smothered with cotija cheese, pepper and cilantro. YUM. The next day, I was making my meal plan. I always ask Nick for dinner suggestions and I get the same response (most of the time): coconut chicken, meatloaf or macaroni and cheese. *Sigh*. Not that I don’t love those dishes but I like to switch things up each week and try new recipes! Well, after he suggested mac n’ cheese I thought it sounded pretty good. Who doesn’t love mac n cheese? Then, he suggested we have Mexican street corn on the side. I was like wait, what? Macaroni and cheese with corn on the cob on the side? Carb on carb? But wait. What if you combined the two? 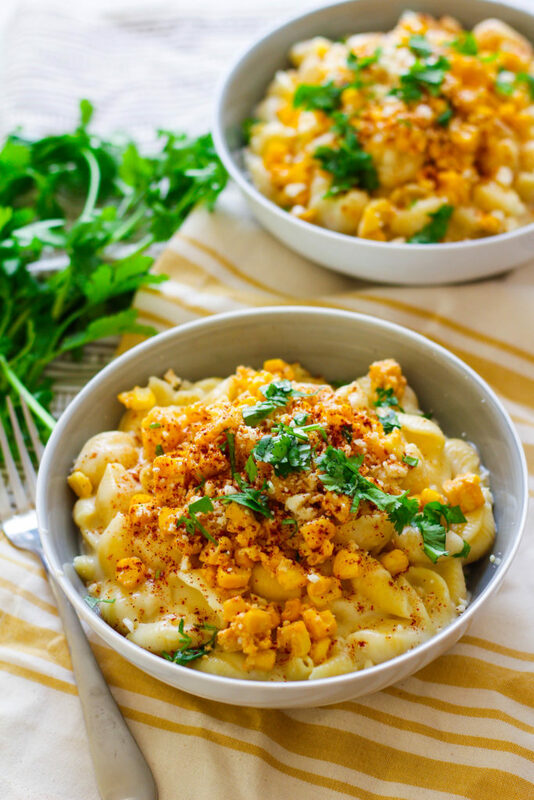 What could be better than cheesy corn and shells? Turns out, it’s a pretty delicious combination. 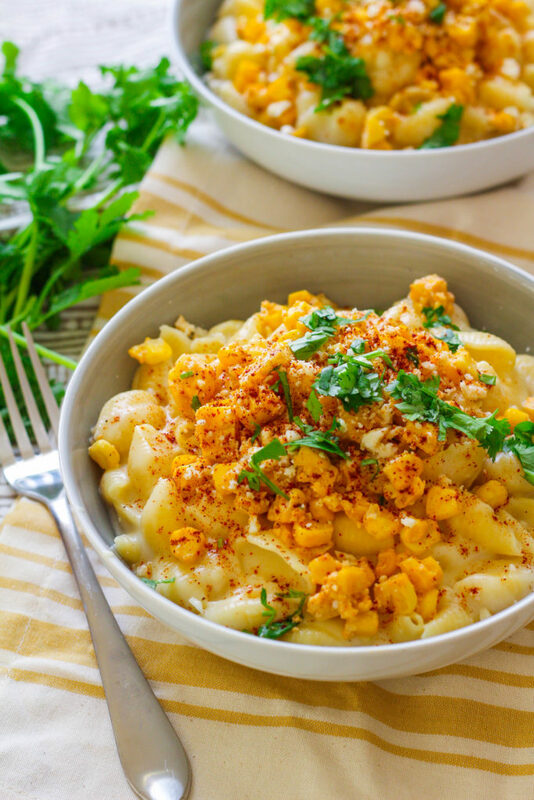 Imagine a warm bowl of homemade cheddar macaroni and cheese with a big pile of fresh roasted corn, tossed in cotija, cilantro and ancho chili powder. I made you a video to show just how easy it is to make! Did you know that the dried version of a poblano pepper is called chile ancho? I knew that ancho chili powder was used in Mexican corn dishes but didn’t realize that it was dried poblano peppers! We love poblanos– roasted and stuffed with rice, ground beef and cheese– so I was excited to hear that you can buy it in dried, powdered form! Poblanos have a mild flavor, only a slight hint of heat. They add a nice peppery flavor to the street corn. The cotija cheese really makes this dish– cotija is a Mexican cheese that’s similar in texture to parmesan. 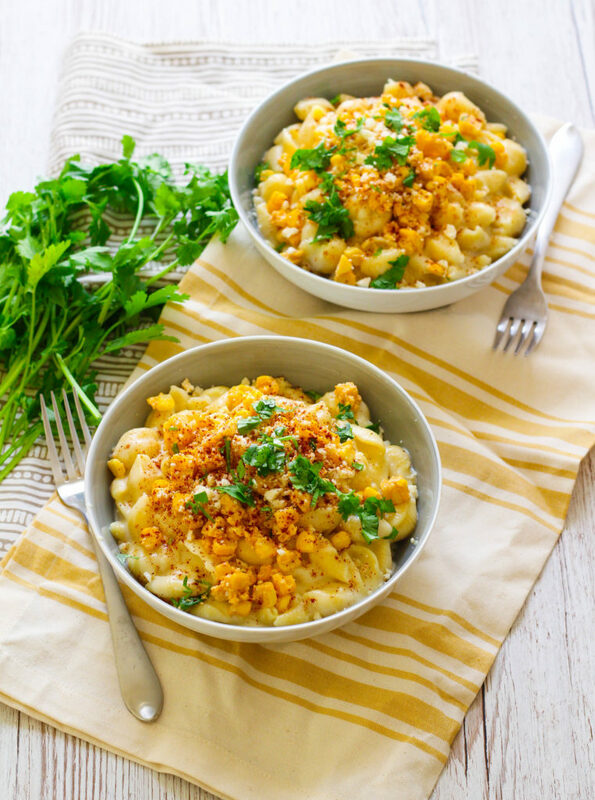 Here’s the recipe for Mexican Street Corn Macaroni and Cheese! Preheat your oven to 350 degrees. Trim the husks on the top of the corn cobs, and place in the oven for 30 minutes. Remove from oven and set aside to cool. Once cool, slice the corn off the cob into a large bowl. Add the sour cream, cotija cheese, chili powder, garlic, and cilantro in a large bowl. Stir and set aside. Cook the shells according to package directions, drain and set aside. In a sauce pan over medium heat, add the olive oil and butter. Whisk in the flour and cook for 2 minutes until beginning to brown. Whisk in the milk and cook for 3-5 minutes, until the milk has thickened. Add the cheddar cheese, salt, pepper and garlic. Once the cheese is incorporated, add the shells and stir to combine. Remove from heat. To serve, plate the pasta and top with a generous spoonful of the street corn topping. OMG. I love elote. It is magical. and to mac and cheese -ify it? Genius! this sounds like a perfect way to indulge in comfort food!!!! Oh. My. Lanta. I am almost in tears over this delicious creation right now. I mean, mac n cheese AND the best, most delicious Mexican side dish in one? Totally a gam-changer. I cannot WAIT to try this!